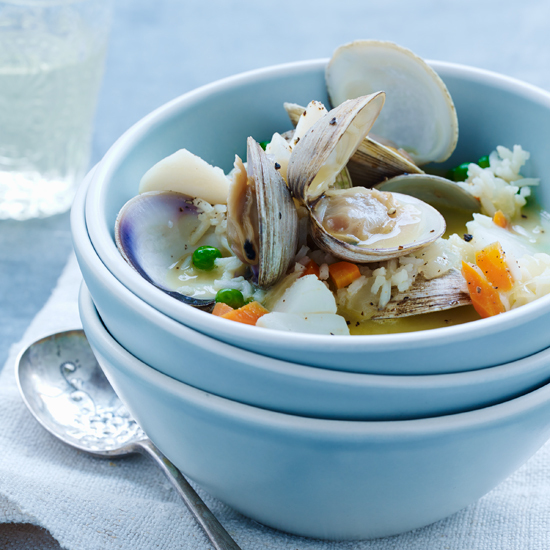 Soup is one of the easiest ways to prepare seafood—shrimp, squid, clams and mussels all simmer together in a flavorful broth, perfect for any time of year. 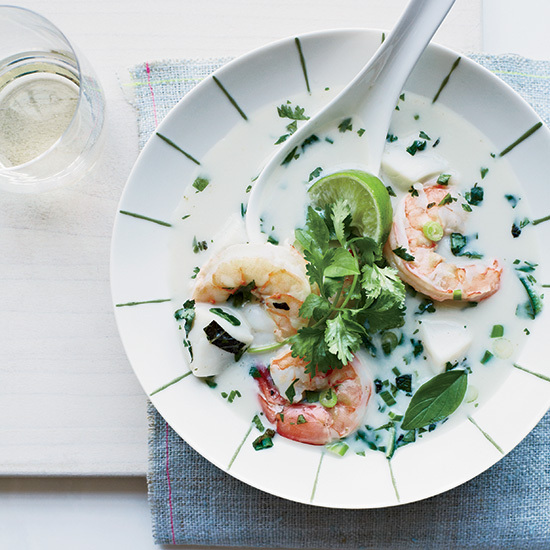 One of our favorite seafood soups is a creamy coconut version packed with Thai flavors. 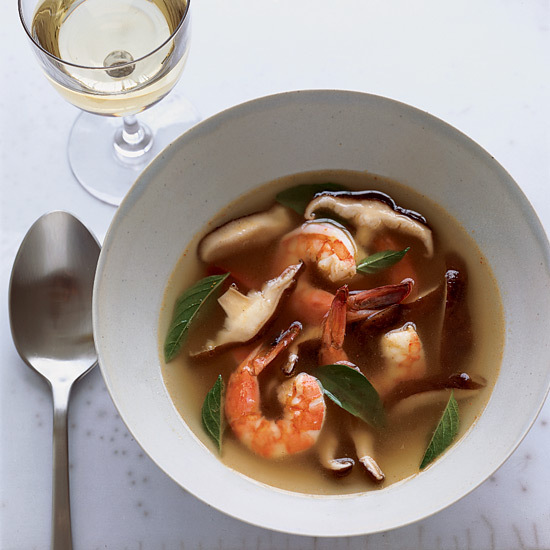 Shrimp and scallops take just minutes to cook, so this soup comes together in a matter of minutes. Green curry paste, coconut milk and lots of fresh herbs transform a few key ingredients into a super flavorful, fragrant meal. 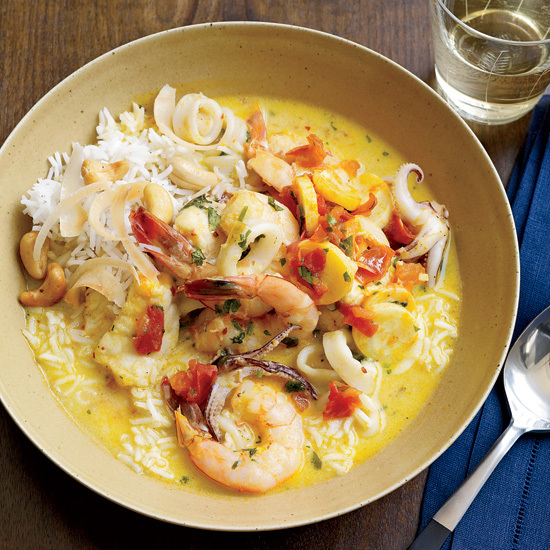 Another F&W favorite is Daniel Boulud’s recipe for Brazilian-inspired moqueca, a seafood soup he makes with shrimp, mahimahi and squid. He marinates the fish in ginger and garlic, and makes shrimp stock with tomatoes, cilantro and hearts of palm. 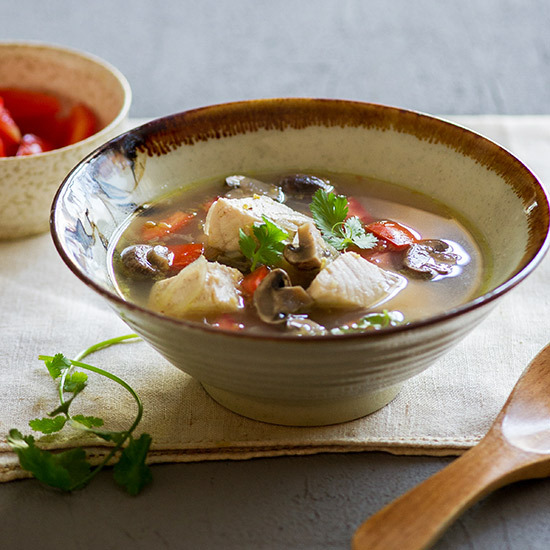 Here, our best seafood soups and stews. 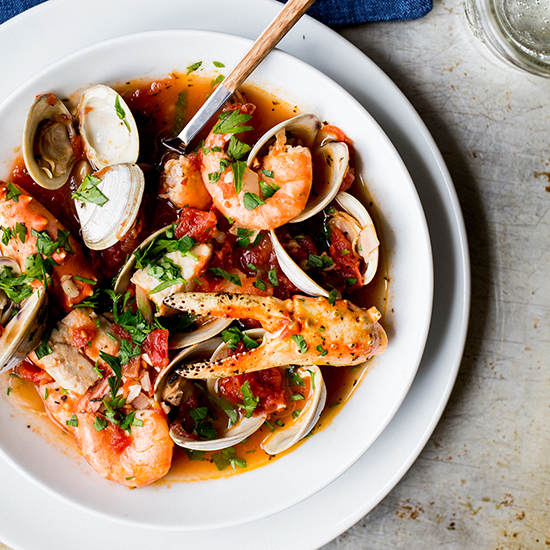 First developed in San Francisco in the late 1800s, this stew relies upon the seafood available to Italian-American fishermen at the time, much in the same tradition as the French bouillabaisse or the Eastern European brudet. In our hot-and-sour soup, lemon and lime zest, lime juice and fresh ginger replace the traditional lemongrass, kaffir lime leaves and galangal, which can be difficult to find. To change the heat level, adjust the number of jalapenos up or down to your taste. "On the Greek island of Kalymnos, fishermen make a stew with shellfish, whole fish, lemon, onion and water," says Andrew Zimmern. "They eat it straight from the pot with their hands--no bowls. It tastes of sweat and iodine, but it is easily one of the best soups I've ever had. 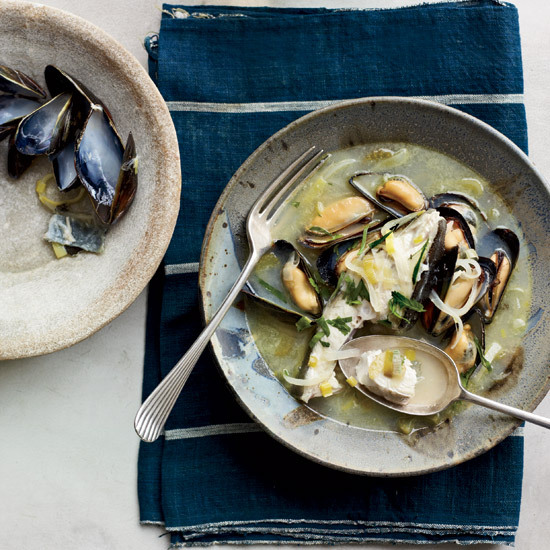 I make my version with halibut, throwing in mussels at the end." A lemony sauce coats rice, clams, and cod in this delicious version of a traditional Greek favorite. If the rice soaks up all of the sauce, add a little more chicken stock. Chef Michael Cimarusti's L.A. restaurant, Connie & Ted's, is modeled on a New England seafood shack. 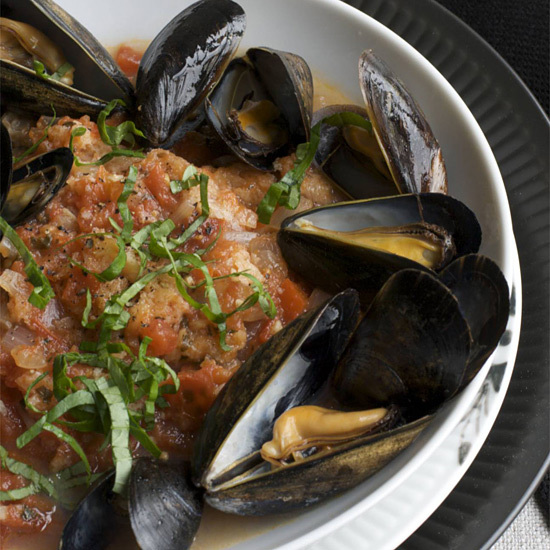 It will feature seafood dishes ranging from clam cakes to this flavorful stew named after his Portuguese uncle. 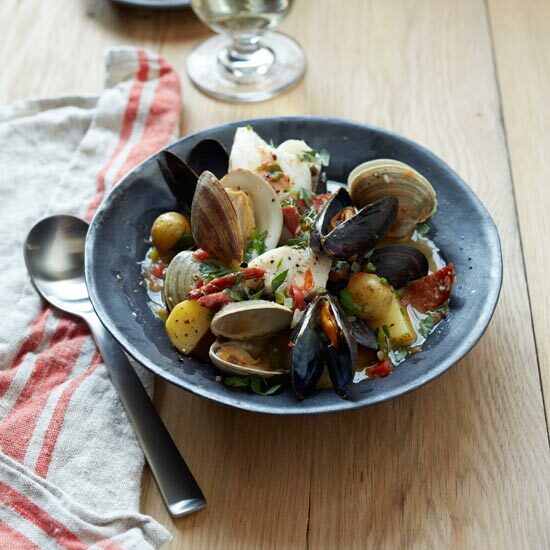 It's loaded with clams, mussels and cod as well as chunks of linguica, a smoky, mildly hot cured Portuguese sausage. Shrimp and scallops are excellent for quick meals, since they take just minutes to cook perfectly. Growing up, Ming Tsai loved the flavors of traditional Chinese hot-and-sour soup, but he didn't like the heavy texture. 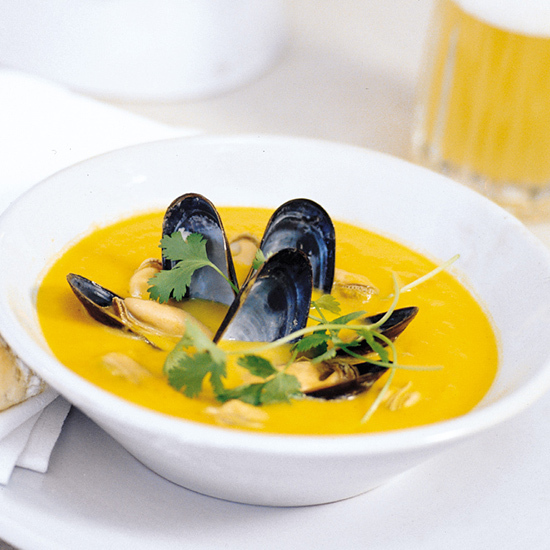 This is his riff on that soup, with a much lighter and tangier broth. At Steve Corry's Five Fifty-Five in Portland, Maine, mussels from nearby Bangs Island are almost always on the menu. "People freak out if they're not there," says Corry, who often steams the mollusks in white wine and lemon juice scented with pickled cherry peppers and garlic. 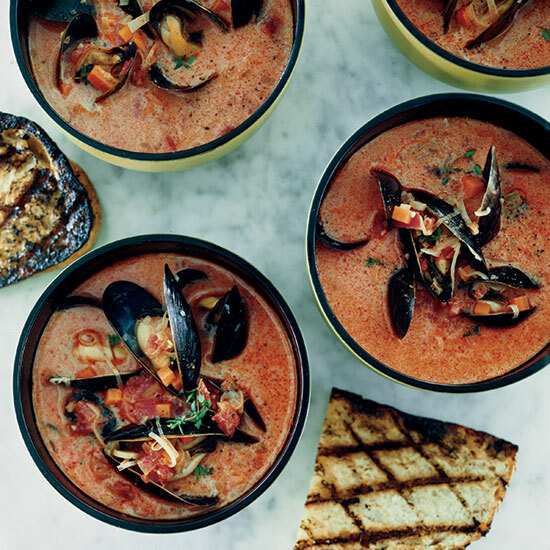 For this Mediterranean-inspired soup, however, Corry serves the mussels in a brothy liquid with plenty of chorizo. In the Middle Ages, Flemish cities were at the crossroads of the Northern spice routes, and brewers and cooks both took advantage of exotic spices. You'll see that influence in this curried soup.